World champions New Zealand will be among Wales' opponents during November's autumn internationals. 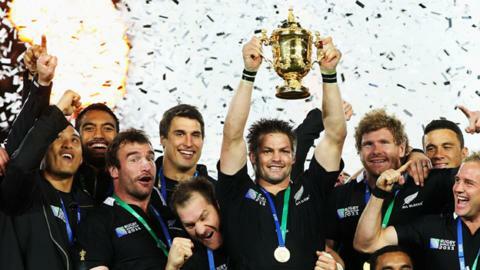 The Grand Slam winners will face the All Blacks in Cardiff on Saturday, 24 November with a 1715 GMT kick off. Warren Gatland's side host Argentina in the opening game of the Autumn series on 10 November before they face Samoa on Friday, 16 November. After playing New Zealand, Wales complete the series against Australia on 1 December. "Warren Gatland has always said we will only get better by playing the best," said Welsh Rugby Union group chief executive Roger Lewis. "Our current Welsh team plays a brand of compelling and engaging rugby which delights our fans and I am confident the series we have on offer will prove to be a great attraction." Wales secured their third Grand Slam in eight seasons with a 16-9 victory over France in their final match of the Six Nations campaign.